I know what you’re thinking, and you’re wrong. Its day 2 of the Microsoft Build conference, and if you’ve been keeping up with the hype you are probably thinking that you need to throw away that WPF or Silverlight app you’re building and start fresh with HTML5 or this new XAML that is the future. If that is what you are thinking, you are wrong. Everything you are doing today you should keep doing. The world didn’t end for you, and your job is not at risk (at least not because of this!). As a .NET junkie going back to the first pre-beta release of the ,NET Framework at PDC 2000 (it was called NGWS back then), and as the former Director of Product Management for Visual Studio, I can tell you that I am comfortable with how useful my skills, and my existing code will be going forward. I am also confident in the value of Telerik’s controls and tools in the future – clearly I knew enough of what was going on with Windows 8 and Visual Studio before I accepted the position of Executive Vice President at Telerik. If I am confident enough to bet my the livelihood of my family on it, you should also be confident in your skills and your existing code and projects. I’ve also been talking to a lot of attendees at Build, and hearing from a lot of Telerik customers via Twitter and email. There is a lot of concern about the future of the technology we are all using today – specifically WPF and Silverlight. 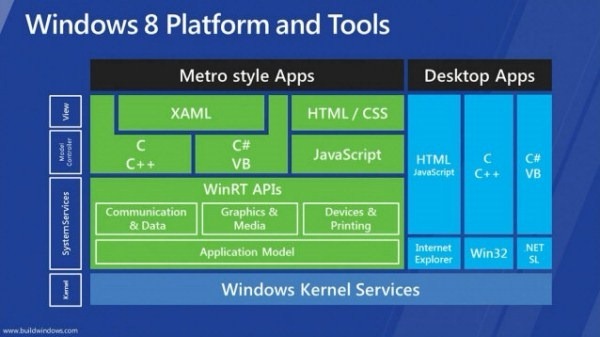 How do these technologies work in the Windows 8 world, and how different is XAML in Windows 8. First things first, let me help clarify a bit of what Windows 8 is all about. The way to think about it is as though there are two completely different runtime environments….because there kind of are. On one side there is the new Metro style app models that run on the new Windows Runtime (WinRT) and on the other is what is being referred to as Desktop Mode running on the CLR, Win32 and/or IE. Here is the diagram that Microsoft presented. In this diagram there is a green side (Metro style) and a blue side (Desktop Mode). While it is not depicted here, there is a big fat solid wall in between the two sides. That which runs in the green side, cannot run in, nor access anything in the blue side, and vice versa. Apps you build for Windows 8 are either Metro styled apps or Desktop Mode apps. There shall be no comingling. This is a great design. Some apps should never be Metro styled apps, and some apps should ONLY be Metro styled apps. Metro style apps run in an Application Container that enforces some security constraints and limits access to some system resources. This enables them to be interesting and engaging apps, with access to some identity services and other appropriate resources, but still have limitations that protect the end users. Desktop Mode applications don’t run in the Application Container, and have all the system-level access available to you today depending on how you are building your applications (e.g. .NET and trust levels, or Win32 and system level APIs). The greatest example of the right use of Desktop Mode not talked about this week is Visual Studio 11 (yes, VS11 was talked about but no one pointed out why it is not a Metro style app). Your dev environment is not a touch-centric, sensor aware app that you’ll run on a small form factor. It is a powerful app that will need access to many system resources and is best experienced with a mouse and keyboard (and preferably more than one high-resolution monitors). Metro style apps are intended to be touch centric, sensor aware, single screen apps that will likely run on smaller form factors more often than a desktop or laptop PC (in fact we were thinking about calling these apps ‘NISA apps’ – Natural Interface, Sensor Aware apps….we canned that idea). Just like Visual Studio is a ‘Desktop Mode’ app, so will be many of the apps you write. This isn’t to say there isn’t an opportunity for you to write a killer Metro style app, it just means you need to think about the user experience you want to enable and choose the app model that is best for your goals. As you build applications between now and whenever Windows 8 ships, and beyond, chances are that unless you’re building an immersive, sensor aware app (like a device centric app or a game), or a rich content experience (like a magazine) you will still be targeting Desktop Mode. All of those business apps will still be Desktop Mode apps, and if that is the case, your use of WPF or Silverlight (including Telerik controls) is safe. All of that code you have today will run in Windows 8 Desktop Mode. To be sure, I spent some time today with some of the folks that build the .NET CLR. They confirmed this to be true, and we spent some time talking about their Pri-0 commitment to not impact existing .NET Framework applications so that they will run in Desktop Mode. Metro style apps are different. There is no support for Silverlight nor WPF for Metro style apps. And frankly you don’t need it. What you do need is controls and components that are compatible with the new XAML model for Metro style apps…and Telerik will deliver. We will begin working immediately on making our controls work in the new Metro style app model (in fact today @worksonmypc showed one of the Telerik demos running on the Windows 8 devices handed out at Build). In the future you will have a toolkit that includes Telerik Desktop Mode controls and Telerik Metro style controls. in some cases these will be the same or similar experiences, but we will also deliver to you Metro style controls that take advantage of all that the new app models offer, such as smaller screen resolutions, touch, accelerometer and other sensor inputs. The one thing I haven’t addressed is the roadmap for Silverlight, and that is because Microsoft hasn’t shared anything beyond SL5, which is currently in RC. It is unclear whether or not there will be an SL6, but this I know – there will be an SL5, and it will have a 10-year support lifecycle. You can safely invest in Silverlight now, knowing that that investment will be supported for longer than the app will be useful, and Telerik will continue to make compelling UI controls for Silverlight as long as enough people want to use that platform. Technology changes like what we are facing now take a long time to get to ubiquity. People are still using Windows XP (over 40% of all Windows usage is still Windows XP) and people will be using Windows 7 for a very long time. Even as people move to Windows 8 they will still live in Desktop Mode most of the time, except when they are using a tablet form factor. My advice…keep doing what you are doing, and invest 20% of your time in learning about Windows 8 and the Metro style app models. We’ve got a while before Windows ships, and a while after that before it becomes the most used version of Windows.